In 2005, SimpleLTC launched SimpleMDS™, a first-of-its-kind software tool to allow skilled nursing facilities to simplify the messy manual process of transmitting MDS assessment batches to CMS and manage related CASPER reports. In addition to its unique simplicity and affordability, SimpleMDS was one of the first industry tools to leverage a cloud-based, software-as-a-service (SaaS) subscription model that allows customers to easily try the product with no risk or long-term commitment. SimpleMDS was an instant hit, with hundreds of facilities quickly adopting it to streamline their MDS workflow and save time. Those facilities have now grown to nearly 3,000 and, to date, customers have used SimpleMDS to transmit and archive more than 17,000,000 MDS assessments. This makes it the #1 choice of SNFs for managing MDS transmissions and CASPER reports, and has helped us to build the nation’s largest private database of long-term care health assessment data. As we all know, working in long-term care means that change is inevitable. One significant recent change is the mandate for tracking and submitting Payroll Based Journal (PBJ) reports to CMS. The new PBJ requirements add an additional burden to SNF workloads — one that can result in stiff penalties if mishandled. That’s why we’re excited to further extend the capabilities of SimpleMDS to allow SNFs to meet the new PBJ requirements. Customers will be able to manage the submission of PBJ .XML files to CMS, as well as PBJ file tracking and related CMS reporting. The PBJ workflow will function in the same simple, visual way customers are used to. 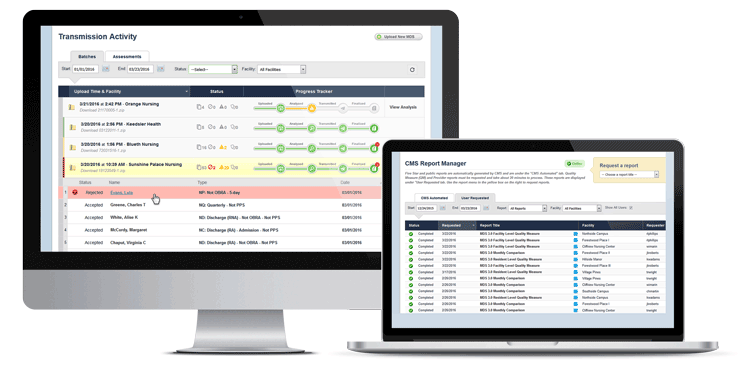 Once PBJ files are completed at your facility, we handle submitting them to CMS on your behalf and retrieve all related validations and reports for you. Visual indicators allow you you track transmission status, warnings and reports throughout the entire process. As SimpleMDS has grown to encompass functionality beyond the MDS 3.0 world, we felt it was time for a new name. That’s why we’re transitioning to SimpleConnect™ as the new name for SimpleMDS. As SimpleLTC continues to grow in the post-acute care world, the new SimpleConnect name better describes the “connection” functionality that allows customers to connect their data with other healthcare organizations and government agencies. You’ll begin to see the new SimpleConnect name on invoices and product sheets in the near future. For over 10 years, we’ve worked to ensure that all our software is affordable for any LTC organization, regardless of the number of facilities or beds. In order to support the addition of the new PBJ and related functionality, we will increase the monthly fee for SimpleConnect™ from $75/month/facility to $82/month/facility, effective Aug. 1, 2016. For more information, please visit our SimpleConnect product page or request a SimpleConnect free demo. You can also request more information about the new PBJ functionality.